Whether you just purchased a home with damaged fireplace tile or your own surfaces have started to show signs of age, you are ready for a restoration project. The most common damage homeowners experience with fireplace tile includes cracks, missing tiles, improperly painted tiles, gouged tiles and efflorescence. A lot of homeowners dealing with these issues may not know what to do. This guide will help you to figure out what to do next. If you use your fireplace often enough, you’ll start to notice that surrounding tile is increasingly darkened by the smoke. Soot will make tile dull and ugly. However, there is a quick fix to this problem: professional tile repair. If you have old ceramic tile, acidic store-bought cleaners will do more harm than good. 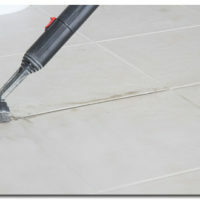 Call in professionals who know how to use professional-grade tools to restore your tiles. When you have fireplace tile that has been partially damaged, rather than removing all of the tile at once, you may want to just remove, match and replace the areas with damage. A tile replacement professional will help you find the ideal match between the new and old tiles. Only tile that is beyond repair should be completely removed and replaced. A professional will help you make the right decision on what to keep and what to remove. The grout you choose for the repair work should have a natural color that complements the tile by having a slight contrast. It’s a good idea to bring samples to help match the color of the grout to see which of them would best suit the tile and surrounding decor. A sanded cement-based grout is recommended for larger grout joints, so that it holds strong. If you have a fireplace in your home that needs grout and tile repair, contact The Grout Medic today: 1-866-994-7688!